The weather is changing. The warm weather and clear sky has disappeared and it is now cool, grey and windy. With only limited weather forecast available from our satellite receiver, we decide to start working our way down Glacier Bay towards Park headquarters. We feel a storm is coming. 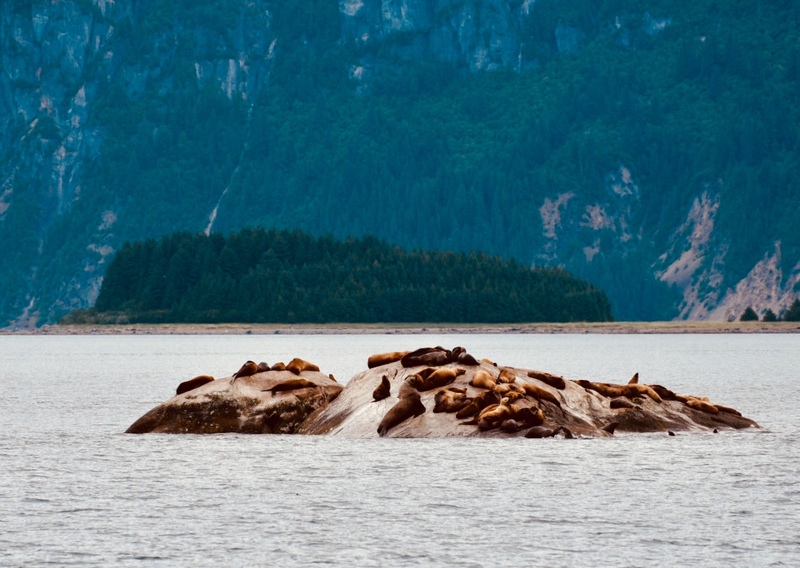 We take a several hour detour back to South Marble Island to once again observe the sea lions, puffins, and whales. Several whales are out feeding today along with the puffins and Stellar Sea Lions. Our anchorage for the evening is in Fingers Bay. The guide book warns of an uncharted rock dead center at the anchorage entrance. After carefully negotiating this passage with all eyes on the lookout, we anchor 100 yards off the sandy beach. This area looks to be prime bear habitat with three pristine streams emptying into the anchorage. We try our luck at fishing for several hours. 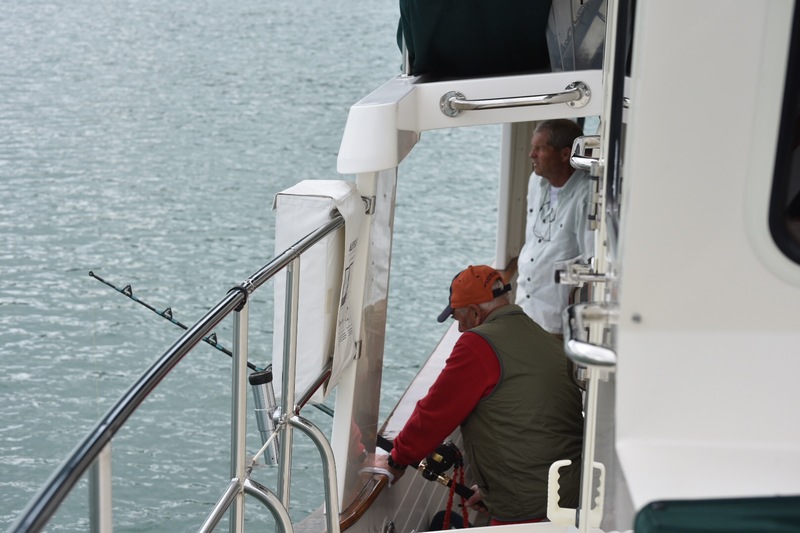 Our only catch is a very small halibut which we threw back but left us optimistic about future prospects. We are finally able to get a current weather forecast. Our fears about the changing weather were correct. Forty knot winds and six foot seas are forecast for tomorrow in Icy Strait. As it is light at 3 am, we decide to depart at 4 am in order to get across the strait before the high winds arrive. This also gives us a favorable current through Sitakaday Narrows. Our five day stay in Glacier Bay was truly amazing. We have a pleasant trip across Icy Strait and continue another eighteen miles down Port Fredrick Inlet to its head. After negotiating around the thousands of crab pots, we anchor in a beautiful secluded spot, well protected from the high winds that are forecast for the next two days. After setting out the halibut rig and our crab traps, the kayaks are deployed for some exploration. Just as Jack and Barbara are about to get in the kayaks, we hear our fishing line singing. Rushing over to the rod holder, I confirm there is a Fish On! 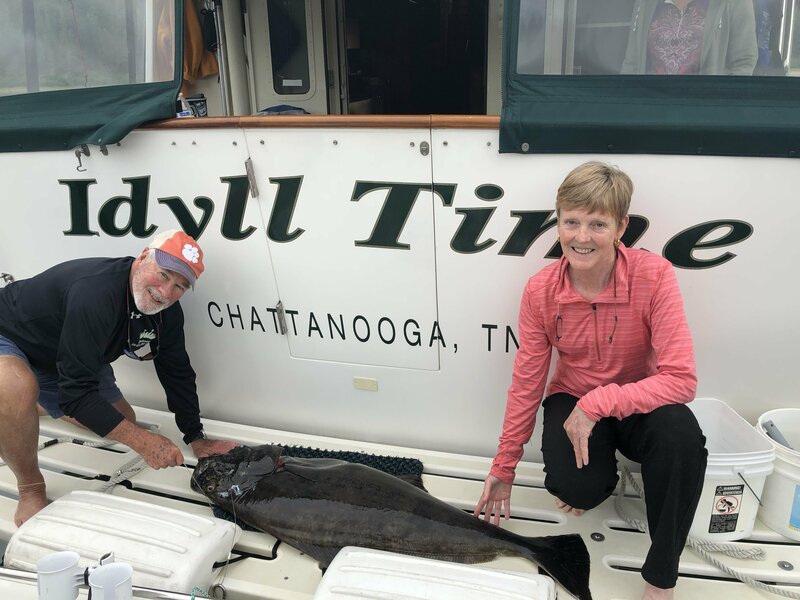 It feels like a big halibut! Jack takes over and fights the fish for over thirty minutes. 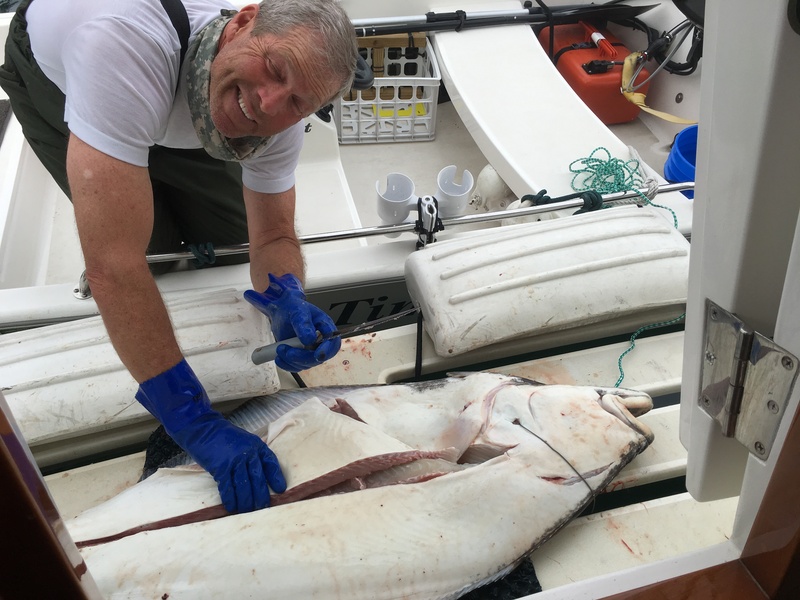 He gets him up to the boat several times, each time the halibut dives deeper. 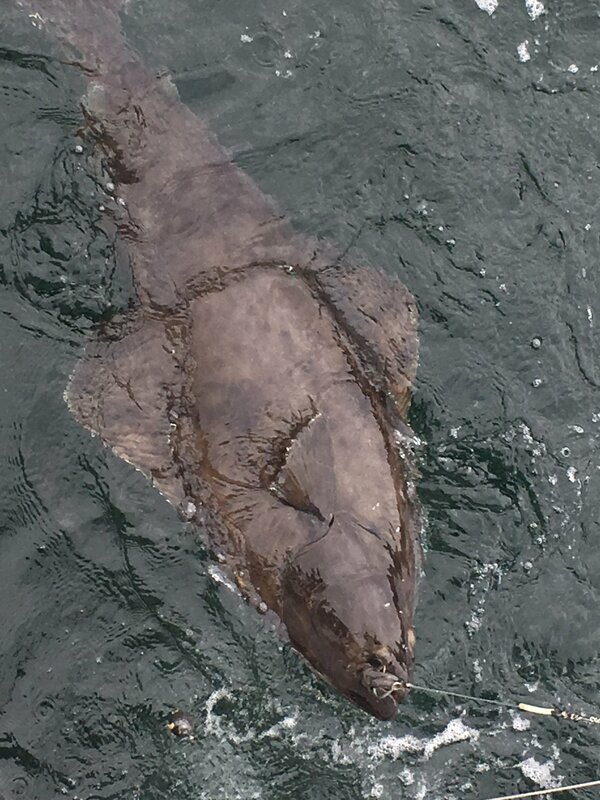 We do get a glimpse of him and he is a really big halibut. 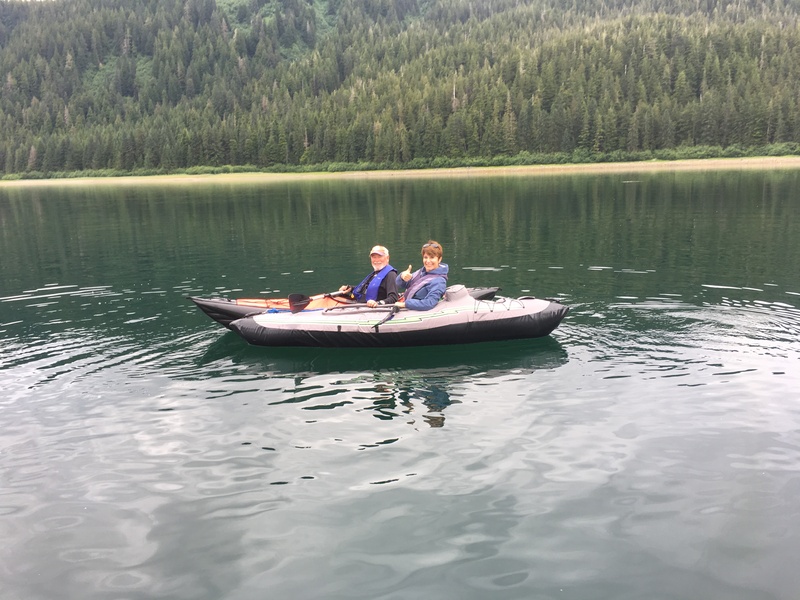 He finally tires, and Jack is able to get him alongside the boat. After several tries, Jeff has him harpooned. He weighs in at 47 pounds. Our freezer is now full! Now it’s time to go Kayaking. Port Fredrick turned out to be good crabbing also. Braving the pouring down rain the next morning, we find nine nice males in the traps. 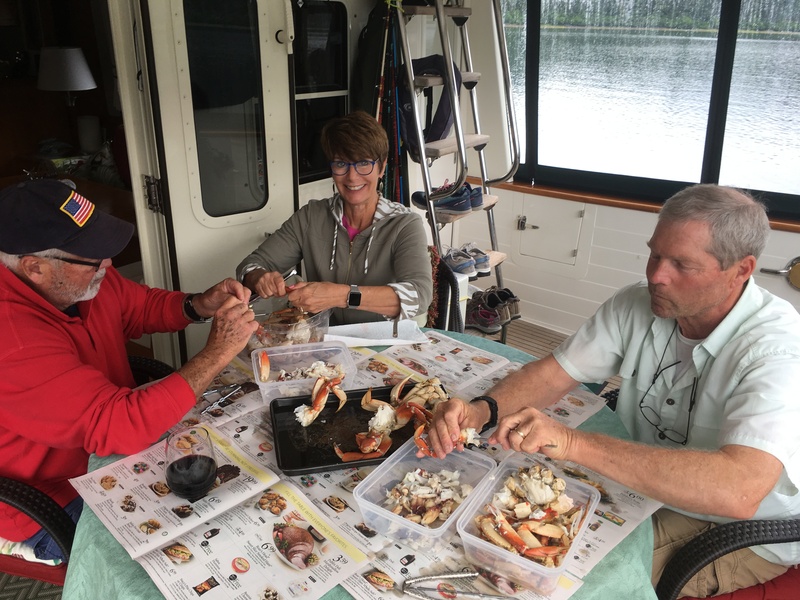 We spend the rainy day picking and eating fresh Dungeness crabs. It doesn’t get much better than this. How quickly a week passes. 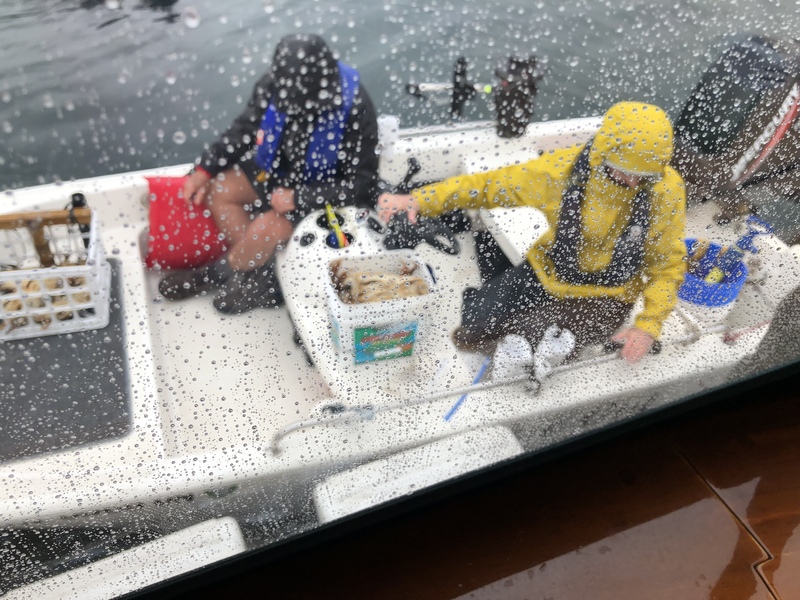 After returning to our slip in Hoonah, it is now time for our good friends Jack and Barbara to begin their long journey back to Tennessee. We have had a great week together. Hoonah is also our turn around point. Tomorrow we will begin our journey south towards Ketchikan and British Columbia ultimately heading to Anacortes, Washington this fall. 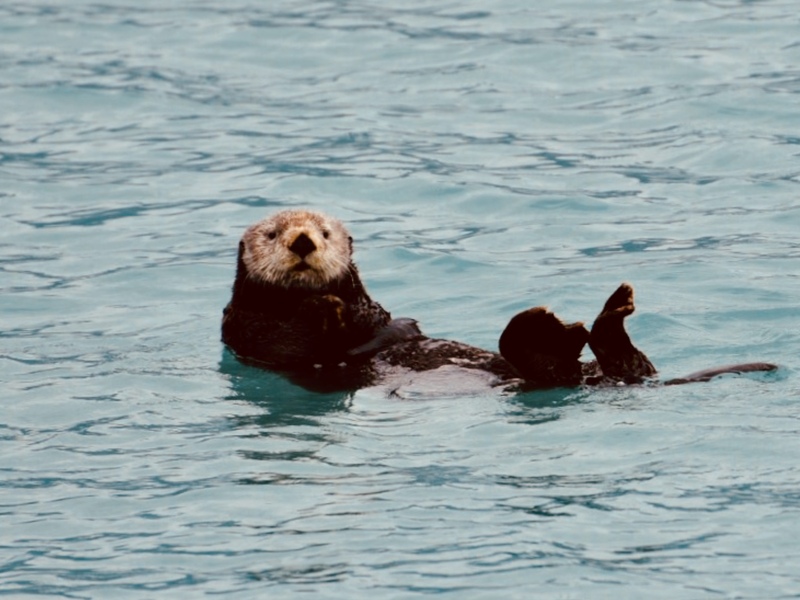 This entry was posted on September 1, 2018 at 1:10 am. You can follow any responses to this entry through the RSS 2.0 feed. You can leave a response, or trackback from your own site.